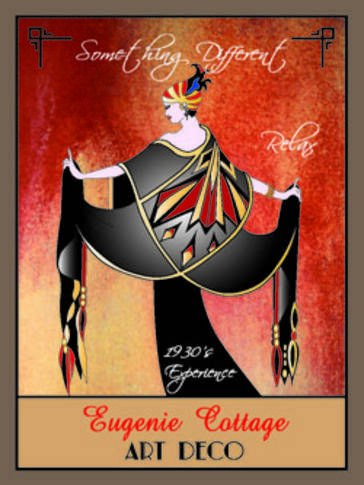 Eugenie Cottage provides private and fully self contained holiday accommodation in one of the oldest houses in Bright, in an Art Deco 1930's style. Set within a cottage garden on historic Elm Tree lined Cobden St, amazing...especially in Autumn when the view from the lounge room is 'yellow' elms. Lovely green and shady in the heat of summer, a stark contrast in the middle of winter as you sit beside the wood fire, gazing out of the front window. Eugenie Cottage is located in the centre of town, around the corner from the main shopping and cafe' area, street markets & seasonal festivities. Suitable for up to 8 guests, in 4 bedrooms, 2 bedrooms contain a queen bed, 2 rooms with 2 singles in each. Features a large lounge, wood heating, plus reverse cycle air conditioning in both living areas, separate dining for 8, well equipped modern kitchen, plus two bathrooms. A private sunny back garden, a large undercover area with hooded BBQ and outdoor setting for 8. The front garden also has seating in the shade for summer. Lockup double garage, ideal for bicycle storage, ski's and other sporting equipment. Plus a full size table tennis table, handy to keep children occupied, or for adult entertainment .. maybe a tournament !!! Relaxing comfort for couples, families and small groups. Ideal for all seasons, incl (Winter) ski holidays. Often 3 generations all together, having separate living spaces. Lounge, large Dining/kitchen, outdoor & 2 bathrooms, everything is provided for 8 people, including all linen & towels. We are an Accredited Cycle Friendly Business. Bike riders love the space and convenience of our lockup storage, plus being within walking distance of restaurants after a long day of cycling, if not inclined to cook..
8 is our maximum No of guests in 6 beds..
We often book 4 people who enjoy the privacy of a room each. Long weekends & festivals. 3 nights. Prices: Cover up to 4 guests per night, extra's at $35 per person per night. Maximum of 8 guests. CREDIT CARDS ACCEPTED ONLINE.. DIRECTLY THRU OUR OWN WEBSITE. A sample of comments from our Guest book... more can be viewed online on our own website. Beautiful house, great location, comfy beds & spotless - great place to stay with friends. We have enjoyed another terrific stay at Eugenie Cottage which comfortably accommodates our extended family, 3 generations together. Everything was perfect, a lovely clean house to relax in. The table tennis was a hit!! we need to return to win the tournament !! a great family event. We have really enjoyed a very relaxing family holiday in beautiful Bright. Thank you. Sharon & Darcy, Clyde & Jane, Jane, Vicki, Eliza. A great place to "unwind" and relax. Your attention to detail is appreciated. Thanks for having us, see you again. Thank you sooo much..what a great weekend, we had the best time, very comfy and enjoyable. Will be back again next year. 1. Ride the bicycle trails .. that radiate out from Eugenie Cottage, passing the door to Wandiligong where you can visit the largest living Hedge Maze in Australia. Have a lunch or coffee with a piece of their enormous famous passionfruit sponge cake. The gardens surrounding the cafe are sooooooo relaxing. Or ride in the opposite direction along the Bike Trail to Porepunkah and beyond. Stopping along the way at the little cafe' at Porepunkah which serves delicious food and drinks. A few kms further along you will pass Boyntons Winery another great place to stop for a refresher. 2. Walk the many nature trails around Bright, Canyon walk being a favorite.. right along the river walking in the footsteps of our pioneers .. viewing the areas they mined for gold.. with descriptions of their activities along the way, crossing swing bridges that span the Ovens river. There are many walking trails surrounding Bright. 3. The Old Tobacco Sheds is a favourite place to browse for antiques, with historical displays covering the old Tobacco Industry of years gone by. 4. A drive up into the High Country over Mt Hotham and Dinner Plain and on towards Omeo. The views are amazing of Mt Feathertop..you feel like you are on top of the world.. Another day .. over Tawonga Gap to see an amazing view of the highest mountain in Vic...Mt Bogong... down into Mt Beauty, then up to Falls Creek and the High Plains ...beautiful country of rock formations, Rocky Valley Dam... Mountain cattlemans Huts and beyond... There are so many different experiences to enjoy from Bright... Snow in Winter, a skiers paradise... Falls Creek is just over an hour drive from Eugenie Cottage, a perfect base for skiing one day and Mt Hotham the next... Mt Buffalo is only 35 mins away and perfect for young families to enjoy the snow.. with toboggan runs and cross country skiing. 5. We have Wineries close by. A Boutique Brewery in town, with live music during the day, of a weekend. Two hotels, one with an outdoor area and live music at night. All walking distance from Eugenie Cottage. 6. An amazing childrens playground beside the river... keeps the toddlers and pre schoolers happy, a toddler pool. River swimming in Summer with a diving board, and slide...for older children and adults. All in the same area. 7. Fine dining,family restaurants, bistro's, and pizza etc. every style of eating is available. Plus the supermarket is 250m from Eugenie Cottage, to supply all your BBQ needs, for a lovely relaxing meal at home, whilst the kids play table tennis in the rumpus room/garage. Four lovely ladies enjoying a “Girls weekend at Eugenie Cottage” .. Thrilled you all enjoyed your stay and considering a return visit.. you are all welcome back anytime. Great house walking distance to town centre. Everything we needed. Very comfortable. Lovely property very well presented. Especially appreciated the little things like soap and dishing washing detergent which is often missing. Front room with cosy fireplace was our favourite spot! Located just a quick stroll to the heart of Bright, Eugenie Cottage is the perfect base to explore this stunning part of Australia. The cottage is well equipped with comfortable rooms and outdoor entertaining areas. We had a wonderful stay, thank you. A beautifully restored cottages with all the comforts of home and some very thoughtful extras. An excellent base if you're a keen cyclist and a wonderful comfort to return to after a hard hilly day in the saddle. This was a great property. The location was excellent for walks and shops. The presentation was at a very high standard and provided everything we needed. The owner was very helpful and our group loved the ambience both inside and outside the cottage. We will certainly be planning another stay in the near future.Treat yourself to a wonderful stay in Bright.